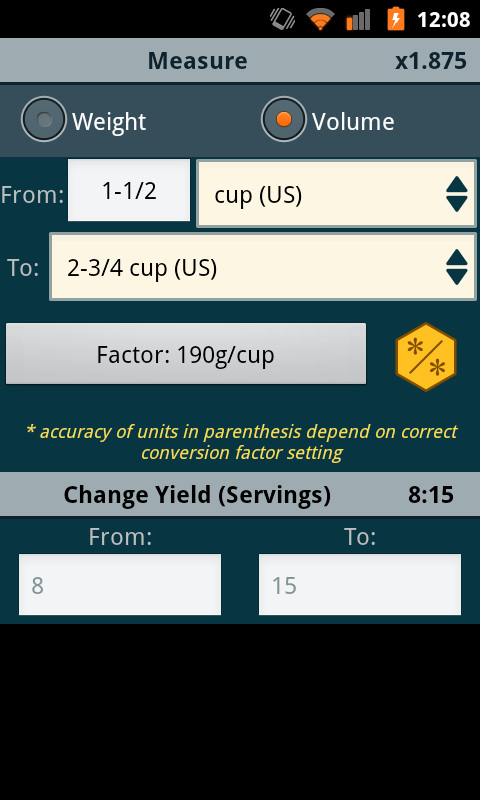 “multiplication factor” and “yield ratio” are just two different ways of displaying the same information: the amount that the recipe servings will be changed. This is set or changed using the yield at the bottom. If “multiplication factor” is “x1.0” and “yield ratio” is “1:1” then the size of the recipe will be unchanged. The “weight/volume conversion factor” is the setting that allows Recipe Convert to accurately convert between weight and volume units. As an example a cup of parsley and a cup of macaroni are the same volume, but not the same weight. By the same token, 40 grams of parsley and 40 grams of macaroni weigh the same, but don’t take up the same volume. 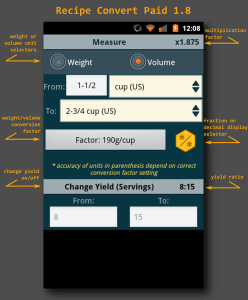 Use this setting to indicate how much 1 cup of the ingredient you’re converting weighs to get an accurate conversion. Luckily, Recipe Convert includes a quickly searchable list of many, many ingredients.